The first half of this Five Nights at Freddy's 4 trailer is the worst. Click. Something is going to happen. Click. Something has to happen. Click. It just keeps getting worse. Click. I can't take any more! I don't think there's any question that the best horror games are the ones that use restraint. Monster closets are fine for what they do, but the fear of what might be out there, hiding in the dark? As anyone who's crept through the Shalebridge Cradle can tell you, that's a whole 'nother kind of scary. It came to light yesterday that the release of Five Nights at Freddy's 4 has been moved up, from its originally planned launch on Halloween to August 8. 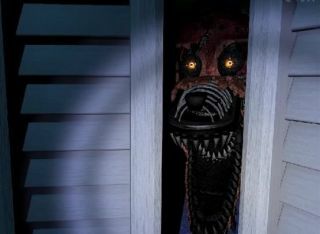 Five Nights creator Scott Cawthon hasn't confirmed the change, but given the timing of the trailer, I think it's fair to say that the nearer release date is looking pretty solid.